LONDON (AP) Sweden's Olympic team is looking to get another Olympic gold medal, from the courts. 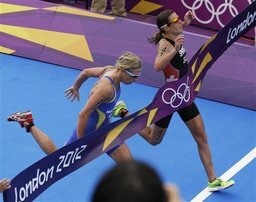 The Swedes appealed to the Court of Arbitration for Sport on Friday to award Lisa Norden a gold medal in the women's triathlon after she finished second in a photo finish with Nicola Spirig of Switzerland. Later Friday, a CAS panel is expected to hear the Swedish case challenging how the International Triathlon Union judged the photo finish. Derived from the Greek words for "three contests", triathlon is arguably the truest test of endurance and stamina, made up of swimming, cycling and running. Though the sport initially took off in fitness-mad southern California in the early 1970s, it's only been part of the Summer Games program since 2000. Yet what it lacks in history, it makes up for in competitiveness. Examine the equipment and trace the race route as Olympians compete under the backdrop of London's historic Hyde Park. Triathlon Events for the 2012 London Games have been completed.